One of the good things about Spring’s STS is that is provides a whole bunch of useful Spring project templates that you can use to generate empty or stub projects from which to start writing some code. 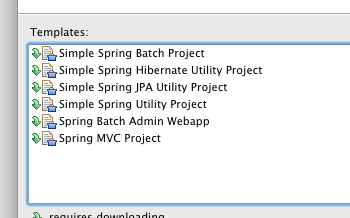 The list of projects includes a ‘Simple Spring Utility Project’ and a ‘Spring Batch Admin WebApp’. 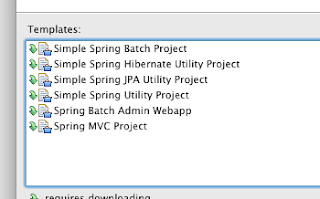 I’ve not had need to generate all these types of project, but I know that when you create a ‘Spring MVC Project’, you get a complete Maven webapp with a very complete POM file. Opening up the WebApp’s pom.xml the first thing that strikes you is what a lot stuff you get - value for money or what? The file contains loads of dependencies and plugins and all kinds of stuff and it's all just to build a simple webapp. It does make you wonder whether it’s all needed, especially when you’re sitting in a cafe’ waiting whilst the empty application shell is downloading an endless string of JARs via a 3G connection. This blog takes a look at the webapp’s POM file and tries to shed a little more light on what’s in there and why, and I’ve done that by commenting the original POM, which is below. Okay, this is optional for a Java app and you can delete it. available at Maven Central then you don't really need this bit. Optional - if you don't want to get hold of sources.